You are invited to the opening of our new exhibition on Sunday 30 August from 2 pm to 5 pm. Please feel free to bring friends and family and enjoy a lively exhibition by two of our best-loved artists. 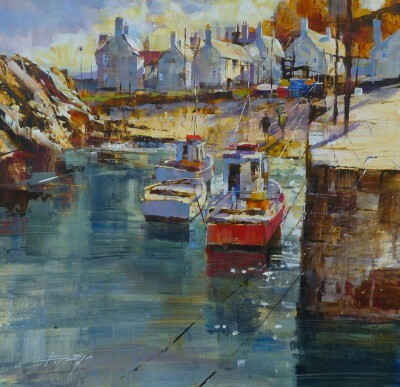 Chris Forsey specialises in landscape; he aims to capture the sense of a place at a specific moment, season or time of day, always bringing passion and immediacy to his mixed media paintings. Gillian Goodheir reflects the ever-changing weather and light on the west coast of Scotland. As well as landscape, she excels in still life, working in gouache, in a fluid spontaneous style. Images and full details of the exhibition will be added to the website shortly before the exhibition opens. We have not yet unpacked all the paintings but it promises to be an excellent show.